Inclusion - what does this mean? It means being included in life and participating using one's abilities in day-to-day activities as a member of the community even if they are "different" from what we deem normal. Inclusion is being a part of what everyone else is, being welcomed and embraced as a member who belongs. Inclusion can occur in schools, churches, play-grounds, work and in recreation. Human beings, regardless of whether they have a disability or not, have basic needs that must be met in order to feel fulfilled. The basic needs of food, water and shelter are necessary for us to exist. It's also easy to see that when you don't eat right or exercise it can adversely effect your health and capacity to function in other areas of your life. Having meaning and purpose to what you do and who you are, provides inspiration. Feeling useless or doing things that are meaningless, decreases motivation and self-esteem. A sense of belonging, being loved, having relationships and friendships with others enriches our lives. Feelings of loneliness and alienation can have a negative impact in all areas of our lives. Education helps meet the need to learn and grow and not remain stagnant, but as with any of our needs, if we focus on one at the expense of the others it does not maximize the overall quality of life. When all these needs are met in an integrated way, each area adds strength in the ability to achieve fulfillment in other areas. 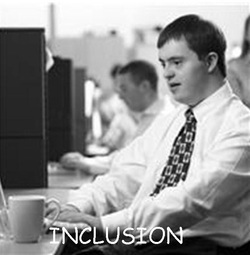 Inclusion is about meeting all those needs, and maximizing a person's overall quality of life.